Look up joist in Wiktionary, the free dictionary. A joist is a horizontal structural member used in framing to span an open space, often between beams that subsequently transfer loads to vertical members. When incorporated into a floor framing system, joists serve to provide stiffness to the subfloor sheathing, allowing it to function as a horizontal diaphragm. Joists are often doubled or tripled, placed side by side, where conditions warrant, such as where wall partitions require support. Joists are either made of wood, engineered wood, or steel, each of which have unique characteristics. Typically, wood joists have the cross section of a plank with the longer faces positioned vertically. However, engineered wood joists may have a cross section resembling the Roman capital letter "I"; these joists are referred to as I-joists. Steel joists can take on various shapes, resembling the Roman capital letters "C", "I", "L" and "S". Wood joists were also used in old-style timber framing. The invention of the circular saw for use in modern sawmills has made it possible to fabricate wood joists as dimensional lumber. Joists must exhibit the strength to support the anticipated load over a long period of time. In many countries, the fabrication and installation of all framing members including joists must meet building code standards. Considering the cross section of a typical joist, the overall depth of the joist is critical in establishing a safe and stable floor or ceiling system. The wider the spacing between the joists, the deeper the joist will need to be to limit stress and deflection under load. Lateral support called dwang, blocking, or strutting increases its stability, preventing the joist from buckling under load. 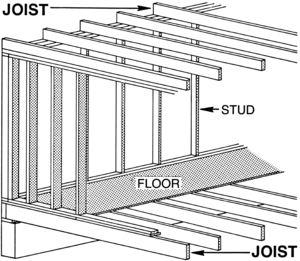 There are approved formulas for calculating the depth required and reducing the depth as needed; however, a rule of thumb for calculating the depth of a wooden floor joist for a residential property is to take half the span in feet, add two, and use the resulting number as the depth in inches; for example, the joist depth required for a 14‑foot span is 9 inches. Many steel joist manufacturers supply load tables in order to allow designers to select the proper joist sizes for their projects. Standard dimensional lumber joists have their limitations due to the limits of what farmed lumber can provide. Engineered wood products such as I-joists gain strength from expanding the overall depth of the joist, as well as by providing high-quality engineered wood for both the bottom and the top chords of the joist. A common saying regarding structural design is that "deeper is cheaper", referring to the more cost-effective design of a given structure by using deeper but more expensive joists, because fewer joists are needed and longer spans are achieved, which more than makes up for the added cost of deeper joists. Wikimedia Commons has media related to Joists.